Yes. Open your invoice and follow link to pay. The PayPal website will open. It's OK if you don't have a PayPal Account. 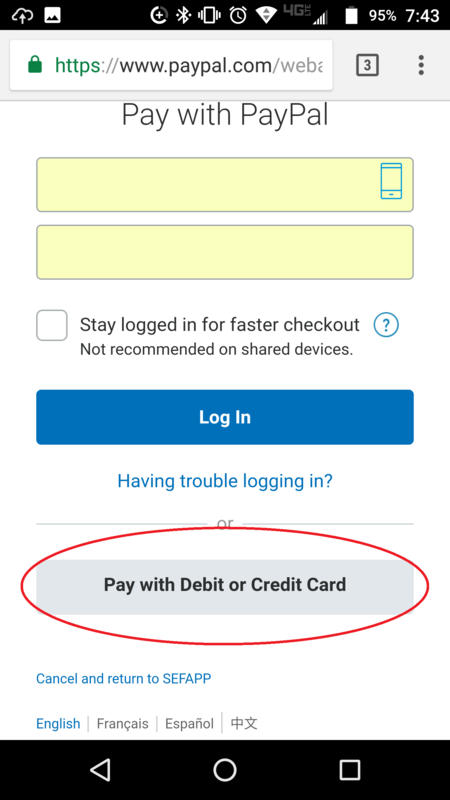 Just scroll to the bottom of the page and you will see a PAY BY CREDIT CARD button. I've opened the PayPal pay with Credit Card page and I still can't make a payment! I registered for an event, but I was not able to attend. Can I have a refund? SEFAPP has a 72hr policy before Event date on refunds for notification from Registrant to cancel registration (on most events) minus a $10 Administration fee. For events that have a specific date before the Event date that Registration MUST be received by, then it is 72hrs from that date specified on the Event page. (ex: FATA event is on 6/1/2018, But Registration MUST be received by 5/10/2018 to reserve a seat. Registrant can cancel on or before 5/8/2018 to receive a refund minus a $10 processing fee.